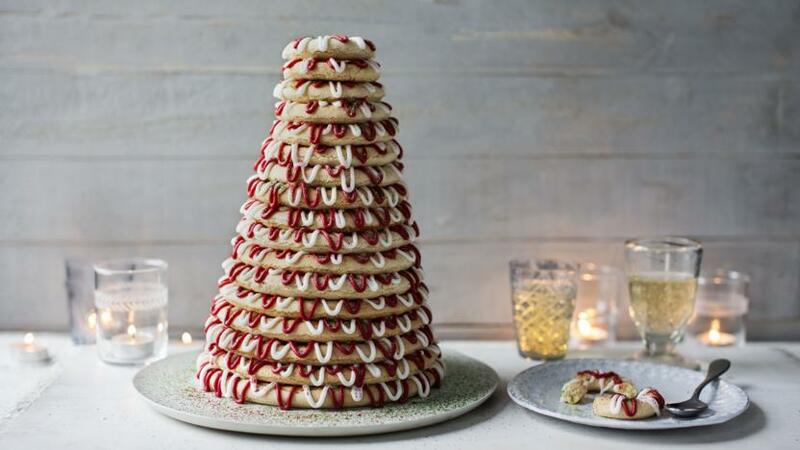 Kransekake is a Scandinavian cake that forms an impressive showpiece at celebrations including weddings and Christmas. Equipment and preparation: for this recipe you will need six kransekake moulds (available from cookware specialists or online). Each mould comprises three rings, giving 18 rings in total. Place the ground almonds and icing sugar in a large electric mixer. Add the egg whites and almond extract and mix with a dough hook. This could be done by hand but is easier with a mixer due to the large quantities. Cover the bowl with cling film and chill in the fridge for a minimum of two hours, or preferably overnight. Preheat the oven to 200C/400G/Gas 6. Lightly brush the insides of the kransekake moulds with vegetable oil. Sprinkle a little semolina into each mould and tip the moulds to distribute the semolina evenly around the inside, shaking out any excess. Divide the chilled dough into six equal-sized pieces. Divide one of the pieces of dough into three different-sized pieces: one small, one medium and one large. Dust a work surface lightly with flour and roll each piece out into finger-width lengths that are long enough to wrap round the kransekake moulds. Fit the longest piece of dough inside the largest kransekake ring, pressing the ends together to seal. Do the same with the medium-sized and smallest pieces of dough. Repeat this process with the remaining five pieces of dough. Bake the kransekakes in the oven for 8-10 minutes, or until golden-brown, then remove from the oven and set aside to cool in their moulds until hardened. Transfer to a wire rack to cool completely. Meanwhile, for the icing, whisk the egg whites in a large bowl until frothy. Gradually whisk in the icing sugar a spoonful at a time, until stiff, glossy peaks form when the whisk is removed. Spoon half of the icing into a separate bowl and add the red food colouring. Whisk until the icing is bright red, then spoon the icing into a piping bag fitted with a small plain writing nozzle. Spoon the white icing into a separate piping bag fitted with a small plain writing nozzle. To assemble the kransekake, sort the cooked rings into size order. Pipe a few dots of white icing onto the base of the largest ring and stick it to a large serving plate. Pipe zig-zag patterns onto the largest ring using first the white, then the red icing, overlapping the two. Sprinkle with red, green and silver edible glitter. Place the second-largest ring on top of the largest ring and repeat the icing and decorating process. Continue to stack the rings in decreasing size order until you have a tower of 18 iced and glittery rings. Allow the icing to set (this will stick the rings to each other), then serve. These buns can be frozen, just pop them in the oven for a few minutes to refresh them. Perfect for starting your Christmas prep early.